I have tried the Bountiful Gardens Tree Collard cuttings twice with no success despite a good deal of effort. I don’t think our summers agree with them. They either didn’t grow or if they did, were a host all the brassica pests and didn’t live long. A plant like that would be wonderful to have in the garden, though. Vicky, thanks for adding that. 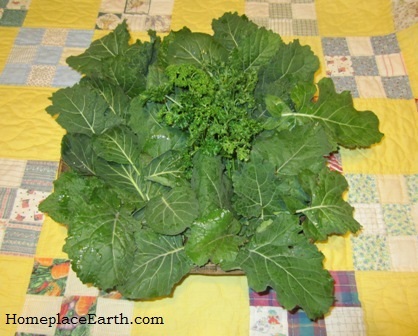 When I was at Ecology Action in 2001 for a teacher’s workshop, John Jeavons raved about their tree collards and offered me some to bring home. We would be traveling for an additional week before flying back, so I declined. Since then, I had done a little research and had decided I would probably have been met with the same results you did. The Mother Earth News version of this blog post will be posted later today and has some companion planting information. I’m definitely going to be doing more of that next year with the brassicas crops. We live in the northern Shenandoah Valley and have had success with wintering over Russian Red, Russian White, Dwarf Blue Scotch, and Winterbor Kale right in the garden. I start them in trays in the house around the 4th of July, and plant them out in the garden in mid-August, after a spring planted crop such as carrots, or an overwintered grain. We put row cover over the plants to keep pests down. The plants usually have enough leaves to harvest by mid-September, and they really grow until the end of November. They get a little scraggly by the end of February, but bounce right back in March. We have gotten a lot of leaves in the early spring with few or no pest problems. The flea beetles don’t come out until it warms up in May, and the butterflies don’t bother them, either. And we really enjoy the kale flower shoots. They are delicious steamed and taste sweeter than broccoli. Kale is such a wonderful vegetable! I like to follow kale with a legume, such as bush beans or cowpeas. Kim, thanks for the info on kale. Maybe I should put spun-bonded row covers on my brassica plants in August to fend off the insects.